A great deal has been written over the last 18 months about the nefarious role played by the White Helmets in Syria. My colleague MarkB recently explored some of the competing media narratives and the relationship between the self-proclaimed ‘humanitarians’ and Guardian journalists. I want to widen the debate further. Who are the White Helmets and what is their stated role? The White Helmets were founded and trained under the supervision of ex-British military mercenary, James LeMesurier in Turkey in 2013. The groups 2,900 members are said to operate as first responder, search and rescue teams in areas outside of Syrian government control. Claiming to have complete neutrality, the ‘humanitarians’ are widely portrayed as selfless individuals who rush into the face of danger and feted as being saviours of humanity. The group have produced a slick website in which they push for a No Fly Zone (euphemism for regime change) in Syria. In addition, their public relations campaigns include a self-promotional advertisement that was shown at a prestigious invitation-only Chatham House event in London. The White Helmets are principally funded by USAID’s Office of Transitional Initiatives, an explicitly political wing of the U.S government that has funded efforts at political subversion in Cuba and Venezuela. 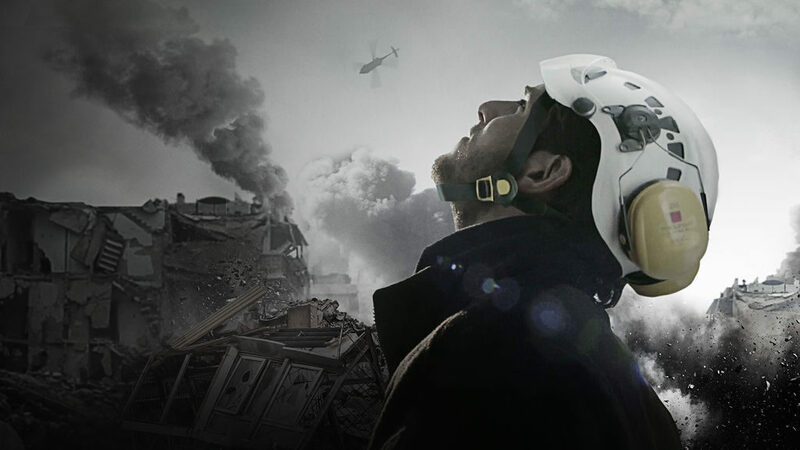 The OTI has committed at least $23 million to the White Helmets since 2013. This money was part of $339.6 million budgeted by USAID for “supporting activities that pursue a peaceful transition to a democratic and stable Syria”. In addition, the White Helmets have received £22m from the UK rising to a probable £32m and £7m from Germany. Other substantial funds come from Holland and Japan. Conservative estimates suggest that at least $100m dollars in total have been donated to the group. These factors alone belie the groups alleged impartial and independent status. The Guardian’s editorial line is that all those critical of the role played by the White Helmets in Syria are propagandists for the “Assad regime”. 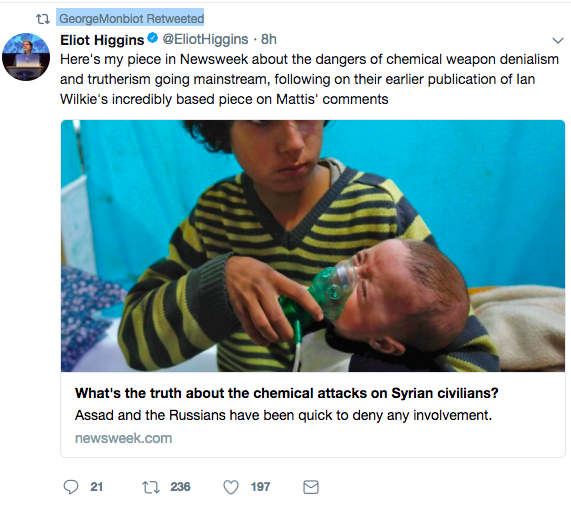 One of the papers star writers, George Monbiot even went as far to suggest that those who challenge the official narrative on Syria are conspiracy theorists. By contrast, some critics of Monbiot’s stance on the White Helmets accuse him of being a bullying hypocrite who promotes commentators on social media who cheer lead for the group, while others claim he is a denialist – an accusation he frequently directs towards his own critics. Some commentators have gone even further by suggesting that the Guardian have provided unconditional support for the White Helmets and that Monbiot’s failure to address any of the criticisms leveled at the group, is indicative of his role as gatekeeper for imperial power and an apologist for al-Qaeda and its affiliates in Syria. That the White Helmets operate only in rebel – mainly al-Qaeda and ISIS-held – areas of Syria, and that evidence shows they are funded by the UK and US to advance both countries’ ‘humanitarian interventionist’ policy objectives in the country, ought to be a ‘red flag’ to any investigative journalist worthy of the name. But Monbiot is not one of them. The ‘liberal-progressive’ journalist has instead by-passed the legitimate concerns of many commentators in favour of aligning himself with proven conspiracy theories and then, without any basis to support his claims, has accused his critics of peddling their own. Monbiot has, for example, refused the requests of Professors Tim Hayward and Piers Robinson to debate the pertinent issues at hand within a forum format on the grounds that to do so would ‘legitimize their conspiracy theories’. However, the Guardian journalist had previously ‘dignified them’ after he had repeatedly and publicly challenged Hayward and Robinson to answer five questions posed by a blogger. But that ‘diversity of opinion’ clearly doesn’t extend to Monbiot or the paper he writes for. The Guardian has repeatedly refused Robinson and Hayward’s requests to respond to the various smears made against them. Instead, the paper recently gave a platform to the head of the White Helmets, Raed Al Saleh – who was denied entry into the U.S – to propagandize for more foreign interventions to save Western-supported Islamist terrorists and child beheaders. 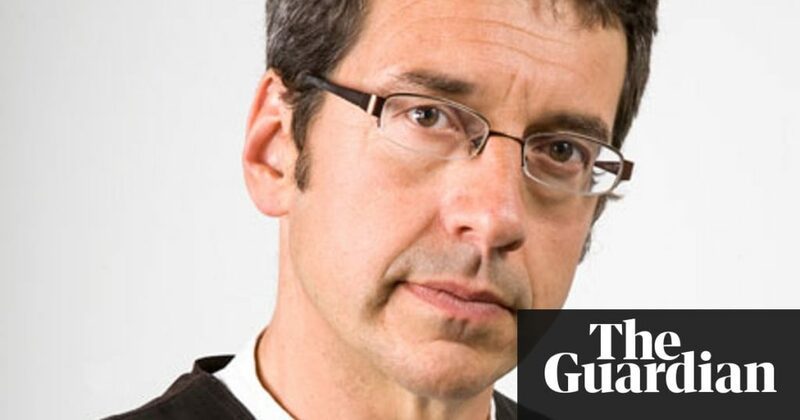 Neither the promotion by the Guardian of a suspected terrorist banned from the U.S, or the denial of academics right of reply, are apparent problems for Monbiot who instead defended a deeply flawed article written by one of his Guardian colleagues, Olivia Solon. Then there is the Guardian’s former Middle East editor, Brian Whitaker’s scornful outburst directed against professors Hayward and Robinson and other British academics, including experts in the study of propaganda, in setting up a panel – the Working Group on Syria, Propaganda and Media – to “provide a source of reliable, informed and timely analysis for journalists, publics and policymakers” on Syria. Whitaker’s misdirection and circular logic and Solon’s hatchet-job – which the latter rapidly removed from her twitter feed so that no one could challenge her claims – is indicative of what appears to be the Guardian’s lack of any genuine willingness to engage in debates questioning the role of the West and the ties between the White Helmets, al-Qaeda and affiliated extremists in Syria. As far back as the period of the White Helmets inception, it was evident to all those who looked beyond the surface of events in Syria that something wasn’t right about the corporate media’s narrative and that Vanessa Beeley, Eva Bartlett and others were on to something. Ubiquitous in the corporate medias coverage of the conflict in the country, have been the images of ‘volunteers’ of the White Helmets rescuing young children trapped in the rubble of buildings allegedly bombed by the Syrian government and its Russian ally forces. What columnist Peter Hitchen’s described as “beautifully composed photographs of handsome young unarmed men lifting wounded children from the rubble, with the light just right”, appears to be emblematic of the corporate media’s systematic war propaganda against Syria. Why is it that high production value coverage of the aftermath of bombing campaigns presented in news bulletins are only seen on our TV screens when they are allegedly carried out by the Wests official enemies? Why, for example, do we not see beautifully composed Oscar nominated images of rescue operations in Yemen? The propaganda offensive in Syria received a major blow on December 20, 2016 after it was reported that the Egyptian police had arrested five people for fabricating images in a factory in Cairo for the purpose of molding public opinion. The suspects revealed they had shot numerous scenes in Cairo that were intended to be spread on social media as if they were filmed from Aleppo. Is it not conceivable that the White Helmets are an integral part of an imperialist war propaganda construct of the kind alluded to by Cockburn, of which the likes of the Guardian, BBC and Channel 4 News are deeply embedded? Vanessa Beeley is one journalist who has argued this case vigorously and extensively. Furthermore, independent researcher, Robert Stuart, has shown that in August 2013, BBC film-makers embedded themselves with Jihadists inside Syria for protection to enable them to produce a sophisticated propaganda piece, and that senior members of the White Helmets were present at the location during the time of the filming. While it is shocking that BBC tax payers are inadvertently funding pro-war propaganda to such a sophisticated and extensive scale, given the history of UK government collusion with Islamist terrorists, it is not surprising. That George Monbiot appears not to have considered the historical context outlined by Curtis, nor the censorship by omission issues relating to the Iraq WMD debacle before arriving at his sympathetic evaluation of the White Helmets and his vitriol against anybody who dares to be critical of this propaganda construct is, frankly, extraordinary. Moreover, the fact that he has not deemed the role played by the White Helmets and the groups possible links to the establishment to be worthy of serious investigation, marks a new nadir for this journalist. Rather than help foster a conducive atmosphere for civilized debate, Monbiot has instead retreated to the gutter. This is a shameful reflection of his, and more broadly, the propaganda role the likes of the BBC and the Guardian are playing within the corrupt corporate mainstream media system. 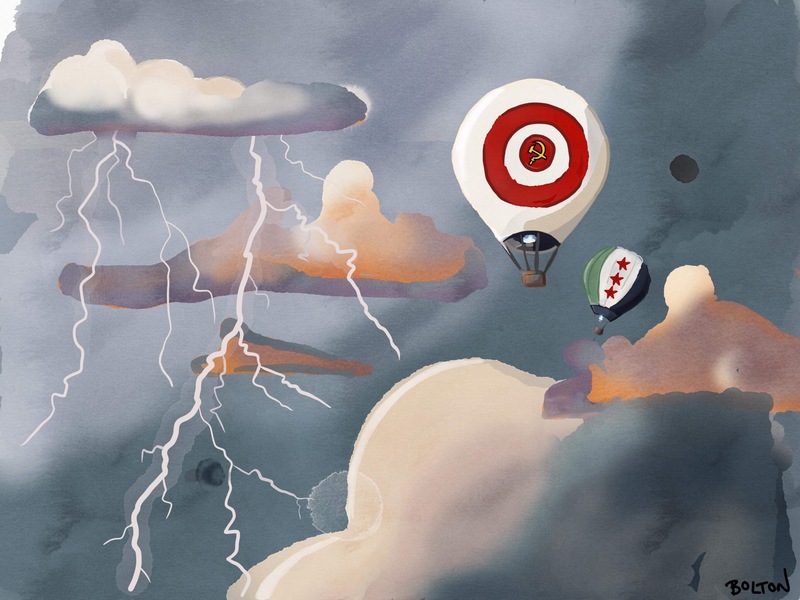 The world’s major superpowers are converging on Syria, the centre of a new Cold War between America and Russia. It's also a significant source of conflict over a natural gas pipeline connecting the Middle East with Europe. Will the outcome dictate the structure of the next century’s ‘new world order’?